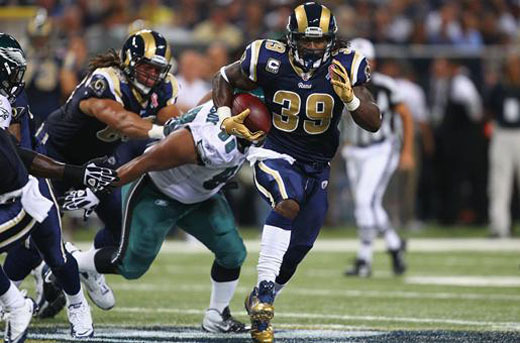 Steven Jackson is active and will play for the Rams this afternoon against the Baltimore Ravens. As first reported by FOX’s Jay Glazer, SJ39 is active and will “give it a go” as St. Louis looks to avoid an 0-3 start this afternoon at the dome against Baltimore. S-Jax and the Rams are very familiar with the intricacies of a quad injury and have erred on the side of caution rather than risk further damage to the muscle or a reinjury. Steven ran for a 47-yard touchdown on the first play of the 2011 season for the Rams against the Eagles. Steven injured the quad on the first play of the Rams’ Week 1 loss to the Philadelphia Eagles. He broke away for the Eagles defense for a 47-yard touchdown, but felt the muscle tighten as he reached the end zone. He returned and ran for nine yards on the first play of the next series, but then left the game for good. No. 39 hoped to play last week, in the Rams’ first Monday night game in five years, but when he went out on the field at MetLife Stadium to test the injury, he couldn’t “open it up” enough to deem himself healthy. It is this week and SJ39 will be in uniform as the Rams host the Ravens at Edward Jones Dome. Ravens All-Pro linebacker Ray Lewis knows what he’ll be in for with Steven on the other side of the line of scrimmage this afternoon. Catch Steven and the Rams against Lewis and the Ravens at 3:05 CDT on CBS.